hdbatik.co.uk | About Batik: What Is It? The technique has been practised for centuries, particularly in Java, Indonesia but also Japan, Malaya and China. The word batik originates from the Javanese “tik” and means “dot”. To make a batik, selected areas of fabric are blocked out by brushing or drawing hot molten wax over them and then the fabric is dyed. The areas covered in wax, resist the dye and remain the original colour, while un-waxed areas absorb the dye. This process of waxing and dyeing can be repeated by waxing additional areas and lines onto the dyed fabric after it has dried, then dyeing in a different colour. Because dyes are transparent, the second colour is changed by the first colour e.g. a blue dye, following yellow, will produce green. Some batiks will have been immersed in three or four dye baths or sometimes, even seven or eight times, usually starting with a light colour and progressing through medium tones, to finish with dark colours. After the final dyeing the wax is removed. A particular effect of successive dyeing is a harmonious combination of colours, i.e. apart from the first colour all the following ones are combinations of all the preceding colours. Some surprising colours emerge and, with care, all will enhance each other. Another effect of immersing batik in dye is the emergence of fine hair-lines within the design. This is caused by the wax cracking through movement in the dye bath or it is sometimes “crunched” deliberately to allow the dye to seep into the cracks which produces a subtle network of lines or “crackle”. When working with wax, usually the fabric is pinned onto a frame which holds it away from the work surface enabling the painted or drawn lines of wax to penetrate right through the fabric. Lines can be drawn with a wax pen called a tjanting or canting. Preferably the fabric should be white or light coloured to provide maximum scope with colour combinations. The first waxing will establish white or light coloured areas in the design. The batik can then be removed from the frame and immersed in a dye bath. Alternatively, it can remain pinned to the frame allowing different dye colours to be applied, brushed or sprayed onto the cloth. By wetting it a watercolour-like effect can be achieved. Painted-on dyes provide greater flexibility with a wide range of colours but the waxed outline or pattern can tend to predominate. Painted-on dyes can be useful when isolated areas are painted onto white fabric, dried, then waxed before immersing in the first “dip” of a succession of dyes. This is particularly useful when more than one primary colour is required in the design. (This method is used in the sky of “Snow Field”, see below). Contemporary batik has developed from the more traditional and formal patterns of the past. Today’s batik artist may use etching, discharge dyeing, different waxes with different degrees of resistance and he or she may work with silk, cotton, wool, leather, paper or even, wood and ceramics. The main difference between batik and painting in oils is the absence of thick paint but, in my opinion, this is more than compensated for by the intricate “crackle” effect absent in oil painting. It would seem, perhaps that the planning of a picture or design is crucial. It is true, once the wax has been applied, removing it before the end of the process is difficult (although some batik artists do remove the wax between each immersion in dye). One has to accept “mistakes” and learn to accommodate them, the skill is in improvising adjustments or changes to the design. For myself, over the years of batiking, I rarely plan the colours in detail. I have a rough idea what sort of colours I am going to use in a piece, and I will be aware of difficulties of being able to achieve a blue after an orange has emerged in a piece. In this case, I will keep the orange subtle and reckon on accepting a resulting grey-blue which usually turns out to be better, (by the nature of harmonious colours). 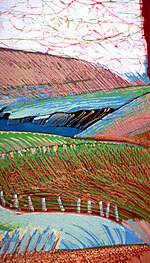 But I do drawings, colour sketches on paper and quite likely, go out into the landscape and paint from observation. I also take photographs but try not to rely too heavily on them. They are more to record the way the light falls on surfaces – shiny grass, the pattern of indentations formed by the sea on a sandy beach, or even the way slanting sunlight coming through a window casts shadows of objects on a wall. These can help in the way a brush-stroke of wax or a canting line is a gesture towards reality. I studied painting and this is how I work.